CANTON, MA (March 5, 2014) -- Guests at Dunkin’ Donuts, America’s favorite all-day, everyday stop for coffee and baked goods, may feel extra lucky leading up to St. Patrick’s Day, as the brand has introduced a full lineup of seasonal beverages and snacks to help celebrate the holiday. Perfect for the “top o’ the morning” or any time throughout the day, Dunkin’ Donuts’ March menu includes Irish Crème and Mocha Irish Crème Coffees and Lattes, the Lucky Mint Coolatta®, Mint Hot Chocolate and two new donuts, Mint OREO® and Mint OREO® Creme. All items are available at participating Dunkin’ Donuts restaurants in select cities throughout the country. Dunkin’ Donuts’ new Mocha Irish Crème Coffee features the smooth, velvety taste of Irish crème blended with a rich chocolate flavor in Dunkin’ Donuts famous coffee. Irish Crème and Mocha Irish Crème Coffees and Lattes are available hot and iced. Dunkin’ Donuts lattes are made with high-quality, 100% Fair Trade Certified coffee beans. Dunkin’ Donuts is also offering guests many mint menu items for March. For an especially cool way to enjoy the month, Dunkin’ Donuts now serves the new Lucky Mint Coolatta®, the brand’s popular frozen beverage with the fun, refreshing flavor of mint. Coffee lovers can also bring home Dunkin’ Donuts’ Peppermint Mocha K-Cup® packs for use with the Keurig® K-Cup® Brewing System for the special price of $5.99. This offer begins on March 9 and is available while supplies last at participating Dunkin’ Donuts restaurants nationwide. 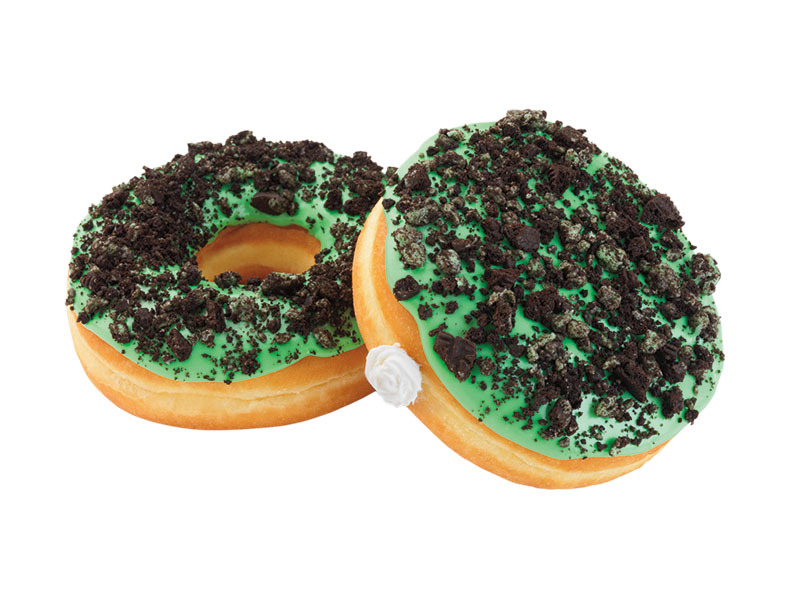 For a sweet treat this St. Patrick’s Day, Dunkin’ Donuts has the new Mint OREO® Donut, featuring a yeast ring frosted with pastel green icing and crumbled mint OREO® cookies, as well as the new Mint OREO® Creme Donut, featuring a vanilla flavored buttercreme-filled yeast shell frosted with pastel green icing and crumbled mint OREO®. Finally, mint returns to Dunkin’ Donuts’ lineup of delicious, smooth and creamy hot chocolate flavors. Guests can once again enjoy Mint Hot Chocolate, which puts a spin on the classic Hot Chocolate with a cool, invigorating minty flavor. Dunkin’ Donuts guests looking to share the green with friends and loved ones for the holiday can purchase new St. Patrick’s Day virtual Dunkin’ Donuts Cards, available in several fun designs. Dunkin’ Donuts Cards can be sent via email, text or Facebook through the mGift feature on the Dunkin’ Donuts Mobile App, available for both iPhone and Android smartphones. With the mGift feature, users can send a variety of virtual Dunkin' Donuts Cards, which can be redeemed directly from a mobile phone at participating U.S. Dunkin' Donuts locations. All Dunkin' Donuts mGifts can also be added directly to the Dunkin' App, reloaded right from the phone, and used as a fast, convenient way to pay. This month Dunkin’ Donuts has also introduced the new Eggs Benedict Breakfast Sandwich, available at participating Dunkin’ Donuts restaurants for a limited time. A traditional sit-down breakfast and brunch classic served on-the-go, Dunkin’ Donuts’ Eggs Benedict Breakfast Sandwich features an egg, Black Forest ham and creamy Hollandaise flavored spread on an oven-toasted English Muffin. March 3 through March 9, sales of Dunkin’ Donuts’ Eggs Benedict Breakfast Sandwich will help make a difference in the fight to solve hunger across America. Dunkin’ Donuts and America’s Egg Farmers have partnered to donate one egg to Feeding America® for every Eggs Benedict Breakfast Sandwich sold (up to 750,000). The eggs will be delivered to select local Feeding America® member food banks throughout the country this spring.